A few of the remaining blossoms on Greenfield Hill dogwood trees frame the historic Greenfield Hill Congregational Church at the start of the 77th Dogwood Festival on Friday. Blossoms are scarce on the famous dogwood trees in Greenfield Hill this year, which each spring are laden with pink and white blossoms, but the annual festival celebrating the symbol of Fairfield's natural beauty still offers an abundance of attractions. The 77th annual Dogwood Festival, which opened Friday on the grounds of the historic Greenfield Hill Congregational Church, showed the signature dogwood blossoms were almost more plentiful in artwork on display and crafts available for purchase than on the neighborhood's hundreds of dogwood trees. The pink petals were definitely beyond their peak because of the warm preceding months. But the white blossoms held up a bit better, adding to the springtime allure of the setting. "They were beautiful two weeks ago. Spring came a little too early this year," said Cary Peirce of Fairfield, who has volunteered at the Dogwood Festival for more than 30 years. "There's still some [blossoms] here, which I'm grateful for because I didn't think there'd be any left. The cool, rainy weather did us a favor keeping the blossoms on the trees," said Karen Wambach, chairwoman of the Dogwood Festival. Melanie Fox, perennial manager at Oliver Nurseries in Fairfield, said the unseasonably warm weather this winter and early spring forced the dogwood trees to bud before their usual time. "The bloom was good, but it was definitely early," said Fox, one of the guest speakers at the third annual Floral Luncheon, one of the many features of the event, which runs through Sunday. Some visitors missed seeing the trees brimming with the landmark pink and white blossoms. Others, particularly those who were attending the event for the first time, didn't really know what they were missing. "It's an unexpected gem. I never knew this whole area was here. 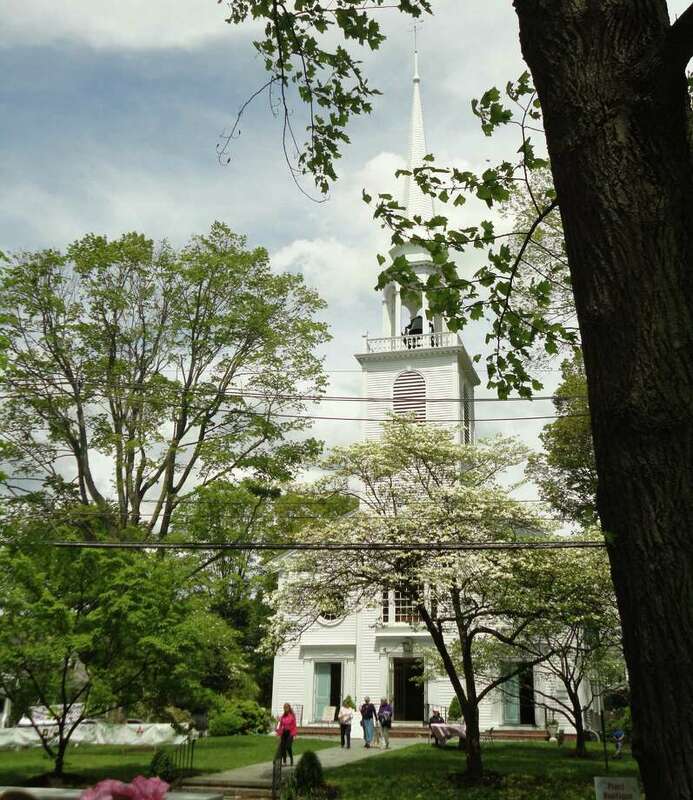 I feel like I went back in time to historic Connecticut with this whole setting, this church and the homes," said Liz Daines of Westport. Jeweler Roslyn Tanner Evans of Suffern, N.Y., who has participated in the festival before, said Greenfield Hill was still beautiful despite the complete lack of dogwood blossoms in some years past. Beth Paradis from the Olive Factory in Waterbury said she was not disappointed the dogwood trees were so far past peak. She was just grateful for the blue skies, sun and breezes. "I'm loving this weather," she said. "This festival has been going on for 77 years. If one year the dogwoods are not here the spirit of the dogwoods remain with us," Peirce said. Judith and Bob Arel of Fairfield said they have many dogwood trees in their neighborhood and they got to enjoy the trees' beauty this year while the blossoms lasted. "Now we're here for the social event and to support the church," Judith Arel said. The Arels started coming to the Dogwood Festival 35 years ago. It began as a Mother's Day tradition for the whole family. "Our children have grown and moved away, and we're retired so we can come any day," Judith Arel said. Dogwoods can be seen in Vera Rahn's oil painting, one of the paintings included in the indoor art show, and at the booth of Yan Yan in the juried craft show on the Greenfield Hill Congregational Church grounds. Yan makes polymer clay jewelry in floral themes. "I made the dogwood pins last night special for this festival," said Yan, a crafter from New York City participating in the festival for the first time. But dogwoods and their images are not the only draw. Bill Kuhn and Madeleine d'Ambrosio of Fairfield enjoyed the art show. Kuhn said he enjoyed recognizing local scenes in many of the paintings. "It's so interesting to look at the watercolor paintings because you learn all the different techniques," said Barbara J. Leeming of New Canaan, as she admired a painting by Alisa Khachian of an American flag blowing in a breeze from a front porch pole. "It's so airy, it's so wonderful, it's so painterly," said Leeming, who has a portrait of her grandson included in the show. "It's a beautiful show. I think it's very unusual. I think it's quite original," said Helen Casey of Redding, a painter who attended the event with her daughter, Beth Casey of North Palm Beach, Fla.
"The colors are just extraordinary. Every single one is so happy. They're so bright and refreshing," Beth Casey said of one artist's work in the outdoor show and sale. The Dogwood Festival features the Blossom bakery, plant and flower boutique, piano duets in the church, radar pitch baseball, guided walking tours, a Meet the Artist reception, and children's activities. New this year is the inclusion of the Blossom Cafe as an event venue beyond the luncheon. It will host live musical performances, Wambach said. "We're trying to introduce more music to the festival," she said. Music performances will be held at the Blossom Cafe on Saturday from noon to 4 p.m. and Sunday from noon to 2 p.m. Proceeds from the Dogwood Festival benefit charities sponsored by the Greenfield Hill Congregational Church Women's Guild. Dogwood trees in Fairfield's Greenfield Hill neighborhood may not be in full bloom for the 77th annual Dogwood Festival, but there will be plenty to do besides admiring the festival's namesake trees. The remaining hours of the festival, which takes place on the grounds of Greenfield Hill Congregational Church, 1045 Old Academy Road, are 10 a.m. to 5 p.m. Saturday, May 12, and noon to 5 p.m. Sunday, May 13. Check the church's website, www.greenfieldhillchurch.com, for details and any revisions.